NES Super Mario Bros. (PRG0) "warps" in 05:15.6 by Bisqwit. This movie is the 2nd of Bisqwit's movies published (his 3rd attempt). It is a mere 3 frames faster than the previous version. 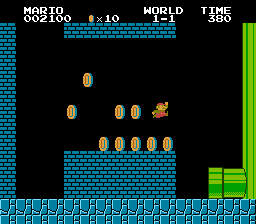 This versions takes a number of detours such as playing with a koopa shell, getting a random coin, and taking time to show off a wall jump.